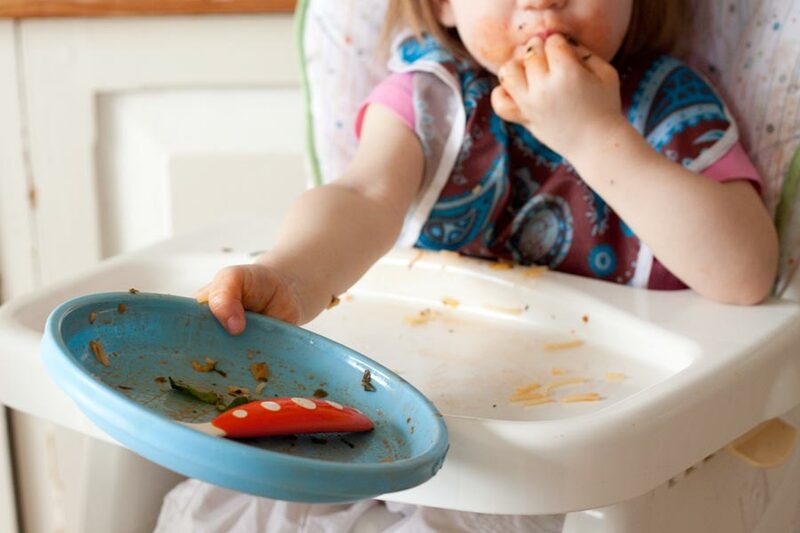 Raise your hand if you have a fussy eater in your life. I have a few. It’s not a whole lot of fun, and can sometimes make mealtimes a real chore. 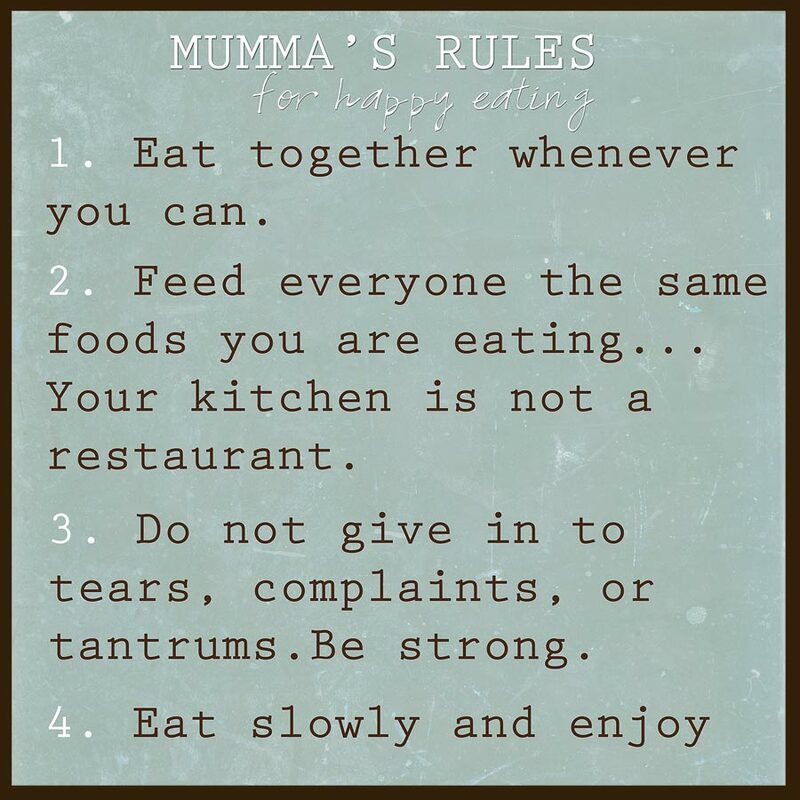 I’m sure there are many mothers, fathers, and care-givers out there that would rather skip meals altogether, rather than deal with the fuss that comes with a picky eater. Wouldn’t it be dreamy to sit down to the table without drama? To actually eat a warm dinner? 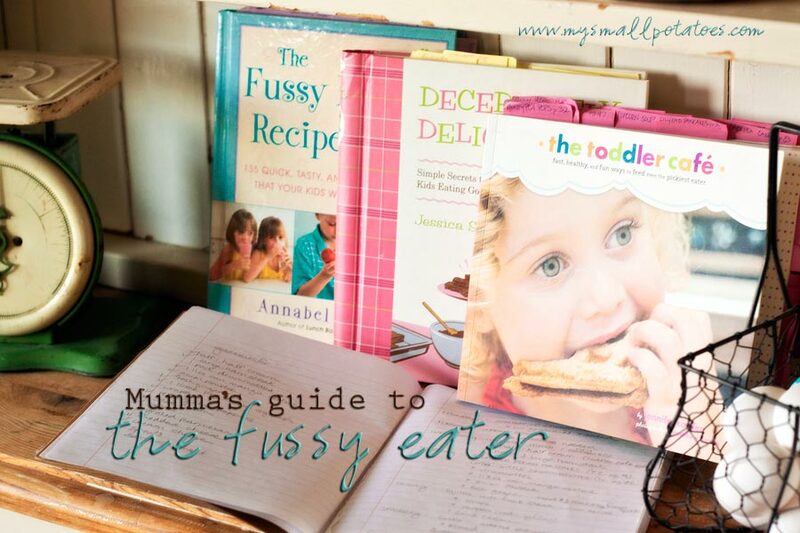 To watch your wee ones walk away from the table with full and nourished bellies? Well, I’m here to tell you it’s not such a far away dream. It can be done. Maybe not for every meal, but for a lot of them. Starting out organized will be your first giant step in gaining back control of your table. When we throw meals together last-minute, we tend to be fussy ourselves. It’s hard to be patient when you’re frazzled. 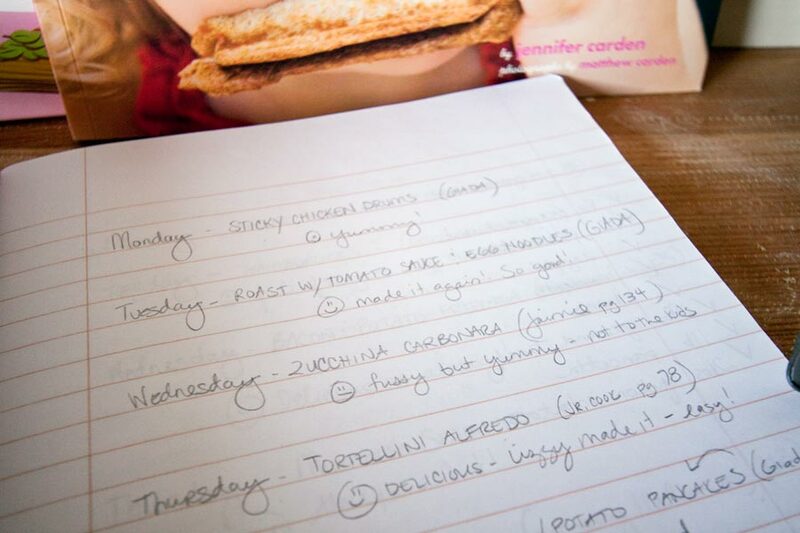 So why not make a meal plan for your week? It doesn’t have to be complicated. I use a little notebook, post-its, and a pencil. That’s it. I LOOOOOVE a good cookbook. Like, LOOOOOVE. So when I get one in my hands, I get crazy with my post-it notes. 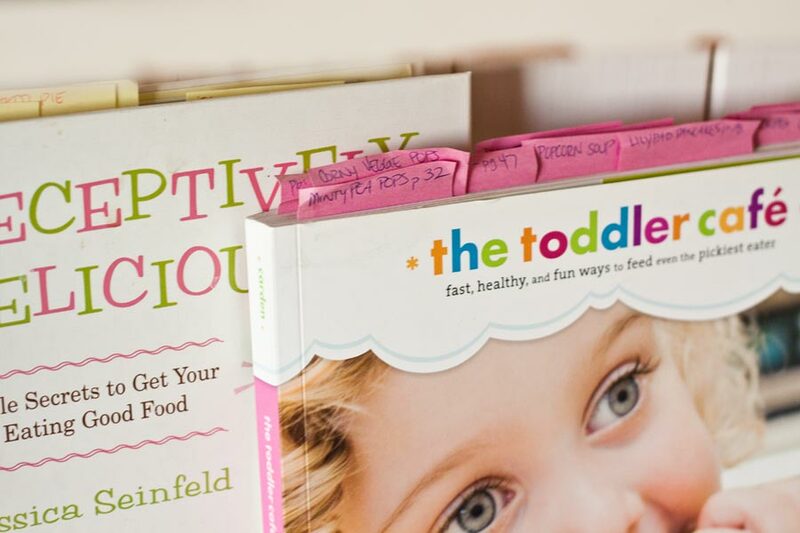 I flip though the book and decide which recipes I think my kids may like. I put a sticky note on the page with the title of the dish AND the page number, incase the note falls off and I can’t find my page again. I don’t always use the kid cookbooks. I think kids should eat what the grown-ups eat. It should look good, taste good, and smell good to YOU before you try to pass it off on your kids, don’t you think? I take it with me (when I remember) and check off the items as I pick them up. So now I’m ready. In theory, there should be no scrambling at meal times to scrape up some food. This will put you miles ahead in the patience department. When you are planning your meals, you will also have more time to consider what each child likes or doesn’t like to eat. This doesn’t mean you plan cereal and hotdogs every meal because this is what your child will eat. It means you choose meals carefully and wisely and you put time and care into guiding your child into a more developed palate. If there is one thing I could help you to remember forever and always, it would be rule number 3 and number 4. I am a mother of 6 kids. I look after 5 OTHER little ones too. That’s a lot of mouths, with a lot of different palates. But if I made meals for every single one of them like a short-order cook? Well, I’d be in the loony bin. Don’t do it! You make one meal. Everyone gets that same meal…even you. If you know that one of them will gag and throw up if he eats peas, you still give him peas. Just give him less. As in, ONE. The children in my house know they have to eat their veggies, or their veggie, whichever the case may be. It’s non-negotiable. Some of them drink copious amounts of water to wash down that pea, but they do it! Do I serve peas every day? Nope. I’m not THAT mean! (wink) I mostly try to sneak the veggies in and make the whole dish a yummy one! As for complaints, tantrums, and whining…well, I get a lot of that too. Whining gets them nowhere but sitting at the table longer than the rest of us. My sister taught me the value of a “No Thank-You Bite.” If I’m serving something new and I’ve got a few sceptics around the table, they need to only have one bite. If they don’t care for it, they can then say, “no thank-you.” But, they have to try it. It’s so fun watching their eyes light up when they realize they actually enjoyed the bite! Hehehehe. This week is about helping you take back your kitchen. To make mealtimes fun and happy times, as they should be. Kids should take pleasure in eating, just as we adults do. It shouldn’t be a chore. It shouldn’t be used as a punishment or a bribe. It should just be a joy to come together at the table and enjoy a meal together. 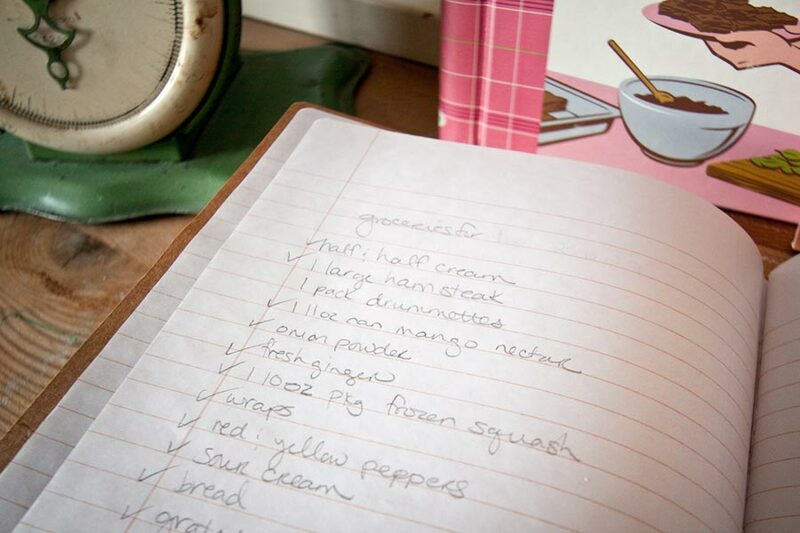 Come back and visit soon…we’ll have a yummy “no fail” veggie recipe for you tomorrow! I love how you showed your process for meal planning. I can never seem to get into a good routine with that. But the weeks that I do it go so much smoother. Thanks for linking up with me at From the Mouths of Moms, too!